With a big name working on a smaller title, things tend to get very interesting. Square Enix holdings includes many different subsidiaries in many different locations all over the world. Square Enix is best known for their Final Fantasy, Dragon Quest and Kingdom Hearts series. Other games published by them are Tomb Raider, Deus Ex, Hitman and many more. Although Oh My Godheads was published by Square Enix Collective, being the indie sub publisher. Oh My Godheads’ developer, Titutitech, on the other hand is not known for any specific game or significant step in gaming history at all. They work on smaller titles rather than the big ones. The game itself does not have much story content, but as the name implies it is about gods and heads or even more specifically the gods’ heads. The game currently has ten heads of famous gods such as Bastet, Zeus and Gaia. All these heads have their own abilities that can either serve as an advantage or as a disadvantage for what it’s worth. There’s also a variety of characters of which you can choose one to play with, but these have no background at all, you’ll be choosing them based on which one you’ll find the more likeable. 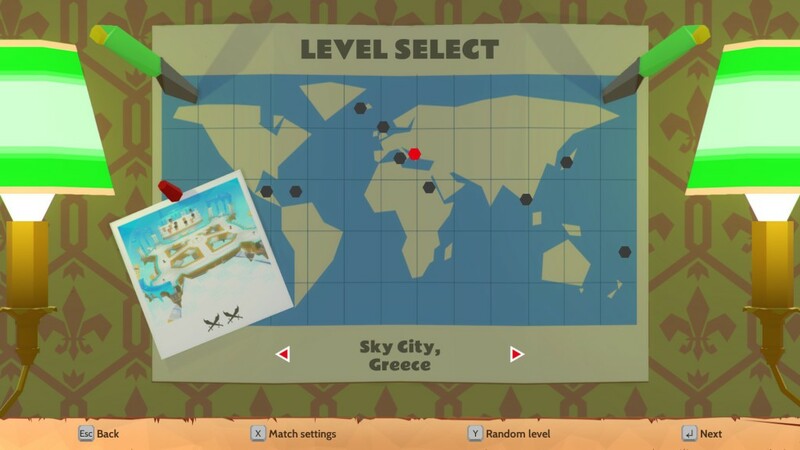 The game contains ten trials as well but these are challenges in which you’ll be trying to do something either as fast as possible or as much as possible. The verdict is as follows, besides the gods and their abilities corresponded through a little backstory there’s no story content whatsoever. The game looks alright and everything runs smoothly. The game has quite the eye catcher though, everything is designed with flat surfaces making them look like geometrical shapes, which is kind of a unique way of designing characters and such. You are given an overview of your character with most of the map on screen, but not yet entirely making it so you won’t always see enemies coming, making surprise attacks a big possibility for your opponents. Every map has its own soundtrack, fitting the map’s location. The music fits the game and its often intense battles quite well. The characters tend to make weird noises from time to time but these are rather hilarious then annoying. 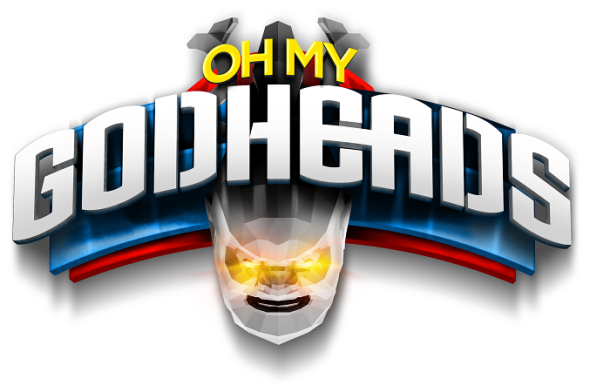 Oh My Godheads is a multiplayer action game, which you can play solo as well but the real fun begins when battling your friends whilst carrying gods’ heads around. There are 5 different game modes that are easily associated with today’s most common game modes in multiplayer games. 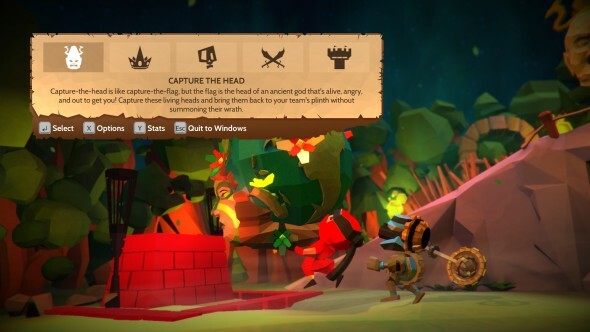 To begin with there’s capture-the-head, a game you can compare with capture-the-flag, it’s basically the same so you’ll have to bring the gods head to your teams’ base or plinth as it’s called in the game to score a point. Next there’s king of the head which is obviously comparable to king of the hill in which you’ll have to hold a location for as long as possible, but only this time you’ll be holding a head for as long as possible. Headhunters is the third game mode within Oh My Godheads that is almost the exact same as today’s popular team deathmatch, you and your team have to earn a set amount of kills. Headhunters has no heads involved at all. The fourth game mode, containing no heads as well, is called last man standing, which speaks for itself, be the sole survivor and you’ll earn a point. The final mode are the trials, these can only be done solo and as mentioned above you’ll either be doing something as fast as possible or as much as possible. 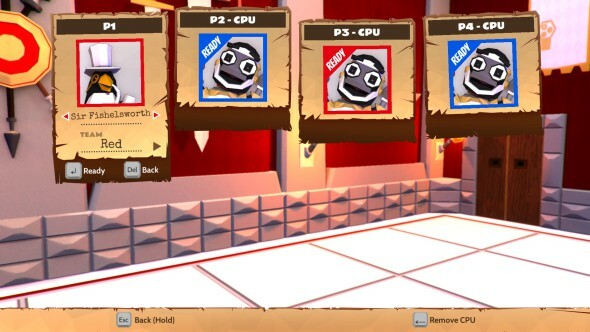 Getting back to the core of the game, which is running around with heads in your hands, these heads all have their own set amount of abilities. There are heads you’ll want to carry for as long as possible and heads you’ll want to get rid of as fast as possible. Few examples, Gaia’s head is heavy meaning that rolling it around is most efficient. Zeus’ head is friend to the bearer so you’ll either be given advantages or your opponents receive disadvantages. 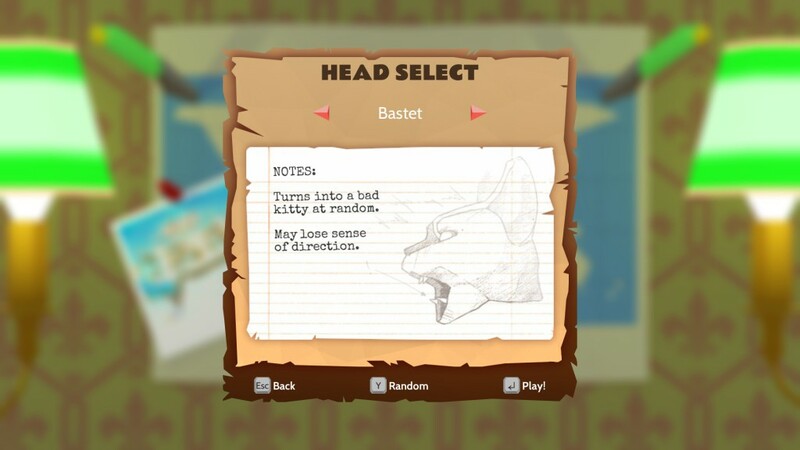 Bastet’s head may cause loss of direction meaning you’ll be running all over the place except to where you’re headed. Speaking for itself game modes without the heads are just the regular battles either team vs team or free for all with no advantages or disadvantages, just straight up combat. You’re also limited to merely a jump button, one to perform a melee attack and one to throw an explosive. One would say the game lacks content, there’s no story mode, or not even a back story to the characters you are using but the fact is that for a small game like Oh My Godheads the game is really fun no matter what. When you are playing the game on your own you are in for 15 minutes of real fun and excitement but it washes off, but when playing with friends you are in for hours of fun. I'm an allround every day gamer. I'm mostly playing the nintendo switch, 3DS or the Playstation 4. To keep things interesting I also sell smartphones for a living. Turtles are not involved in my life whatsoever.